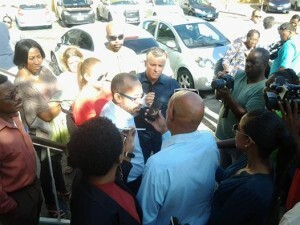 WILLEMSTAD – As was expected, the former Prime Minister of Curaçao, Gerrit Schotte, announced through his defense lawyer, Eldon Sulvaran that he will appeal the decision of the judge today in the Babel case. “We will appeal, which means that Schotte should still be considered an innocent man,” said Sulvaran. The former Prime Minister was sentenced this morning to three years in prison. His life partner, Cicely van der Dijs was also sentenced to eighteen months in prison. She will only have to stay in prison for nine months. The other nine months are considered probation.